Earlier this week, I talked about the way I handle writing letters when I’m on the road. It was always wonderful, when I was out of town, to receive an unexpected letter. Today, I want to encourage you to write to people who are far away, often for the first time in their lives, and isolated. 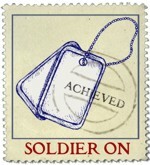 As a suggestion by several members, we’ve added the “Soldier On” achievement. This is to encourage you to write to a member of the armed services. As a friend of mine, who served in Afghanistan said, “Even with the internet, it’s still an isolating time because you can’t talk about how scared you are.” Letters from home are a bright spot without any pressure to be cheerful and pretend. Maybe someone in your family is serving, or a friend? If you don’t know anyone and are looking for more people to write to, there are several organizations that will forward your letters to service members or pair you with a pen pal. Now, those are all in the U.S. If our participants know of any for other countries, I’ll gladly include them. Things to keep in mind when writing — each organization will have very specific guidelines so make sure you read them before starting your letter. There’s a whole host of things you can’t mail, for instance. There’s a good set of articles on eHow about writing to members of the armed services that you might want to check out for ideas.